Located in the quiet cul-de-sac this modern, refurbished ground floor one bedroom flat benefits from being within close proximity to Grimsby road with regular bus routes to Cleethorpes and Grimsby town centres, and popular shopping. 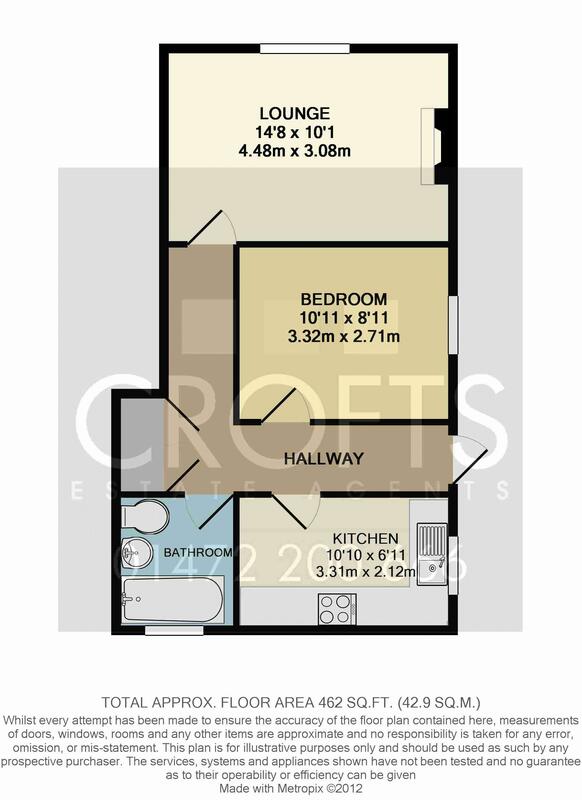 This modern economical flat also boasts gas central heating, double glazing and is alarmed. The accommodation briefly comprises:- generous lounge with feature fireplace and neutral decor. Spacious kitchen, double bedroom and bathroom with shower over the bath. Allocated car parking space. Entered to the side of the property the central hallway has all the rooms leading off and has a generous airing/storage cupboard. Newly carpeted floor and central heating radiator. To the rear of the property the kitchen is fitted with a range of modern matching wall and base units with complementary roll edge work surfaces fitted over and splash back tiling to the walls. With ample space for an abundance of kitchen appliances the kitchen also has a stainless steel kitchen sink with drainer and mixer tap fitted over. The kitchen has a central heating radiator, double glazed window and is finished with a recently laid modern mosaic pattern vinyl flooring. To the front of the property the generous lounge has a newly carpeted floor complemented with neutral decor to te walls. The room is centred around a feature fireplace with an inset gas fire with an attractive hearth and framed with a decorative surround. Double glazed window and a central heating radiator. The double bedroom to the side of the property has a newly carpeted floor, central heating radiator and a double glazed window. The family sized bathroom is fitted with a matching three piece suite comprising paneled bath with mixer shower fitted over, pedestal wash basin and a low level flush W.C. Neutral decor is complemented with pleasant wall tiling to the splash areas and mosaic pattern vinyl flooring. The bathroom is finished with a modern newly laid tiled floor to match the kitchen, central heating radiator and a double glazed window. The ground floor flat has the benefit of an allocated single parking space.